The holiday season is upon us and most folks have begun the dreaded task of shopping for the mountain climber they know. It’s an arduous task. Personally, I field lots of questions from well-meaning family and friends about which piece of gear is best this year or what would be a welcome addition to their climbing friend’s gear room. This year I’ve agonized over making my own list (I could always use something! ), so I’ll spare you some of the trouble. New Climber: A helmet that fits. A gift certificate is probably best here. Trad Climber: A gift certificate for the upcoming Black Diamond X4 cams. Ice Climber: Petzl Lynx crampons — super-adjustable; they fit more boots. Sport Climber: Petzl GriGri 2 — lighter and works with smaller diameter ropes than the old model. Boulderer: A set of soft bristled brushes to scrub old tick marks from their project. Alpinist: Black Diamond Compactor Ski Poles. Save those knees. Backcountry Skier: An avalanche airbag backpack. New models by Mammut, BCA, and ABS are all great. In-bounds Skier: A helmet. Take them to the ski shop and find one that fits. 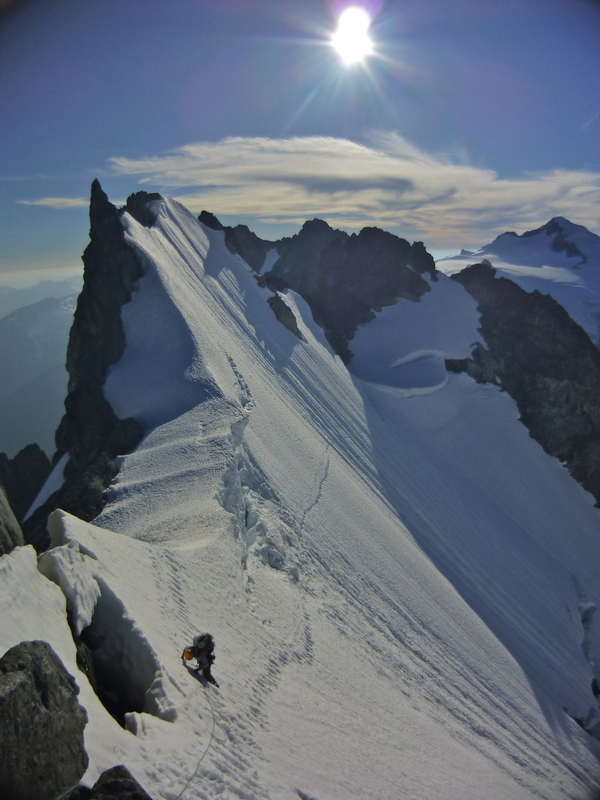 Armchair Mountaineer: Beyond the Mountain by Steve House. A page turner. Everyone: A day of guiding or instruction with an AMGA certified guide! 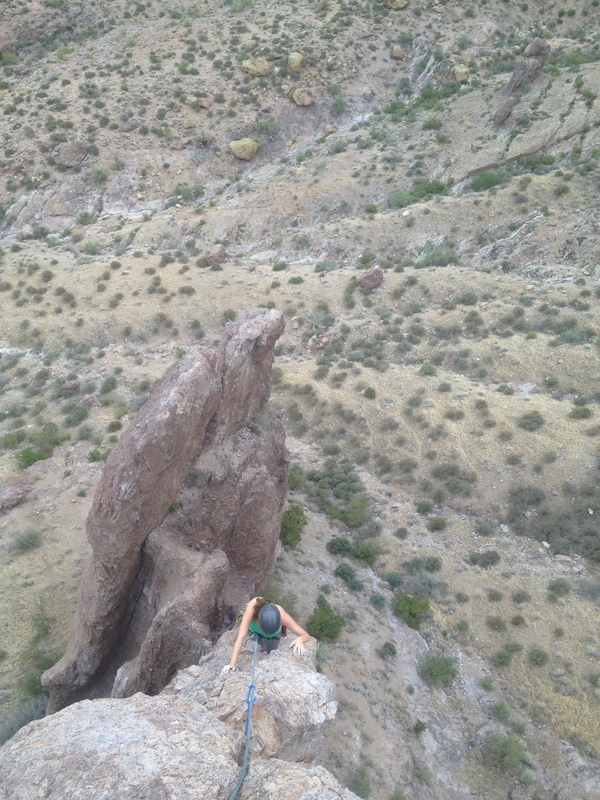 This morning we stopped for a quick run up one of Central Arizona’s classic climbs, The Razor’s Edge (II, 5.6R) on The Hand. 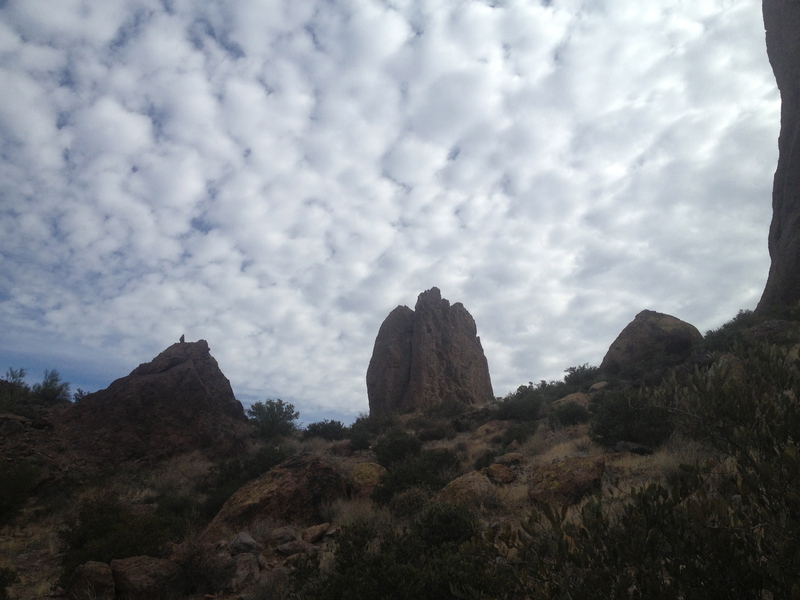 Tucked into the hillside above Lost Dutchman State Park on the edge of the Superstition Mountains (just east of Phoenix), The Hand is only about an hour from the parking lot. We were intrigued by other spires and buttresses that dotted the hillside as we got closer, but we stuck to our plans for The Hand. The Hand on the approach. The Razor’s Edge climbs the right skyline. 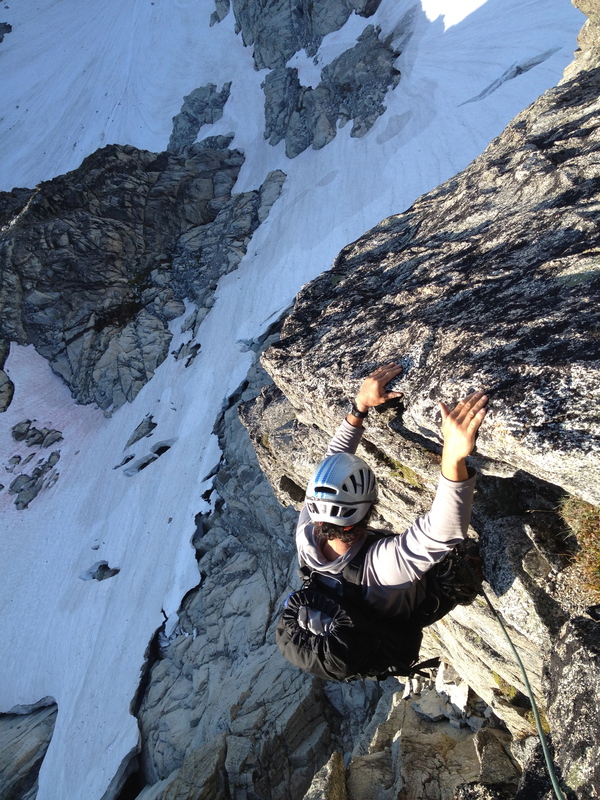 The route is climbed in two (or three) pitches, each of which have eye opening exposure and committing climbing. Be warned that the protection is mostly inadequate (old bolts have not been replaced due to a bolting ban) and there was an exceptionally bad piton low on the route which made me laugh as I clipped it while looking at a 50′ or longer potential fall. Don’t blow it! At the belay on Chicken Ledge. So narrow one has to straddle the crest! We took in the view for a few minutes from the summit before preparing to descend. 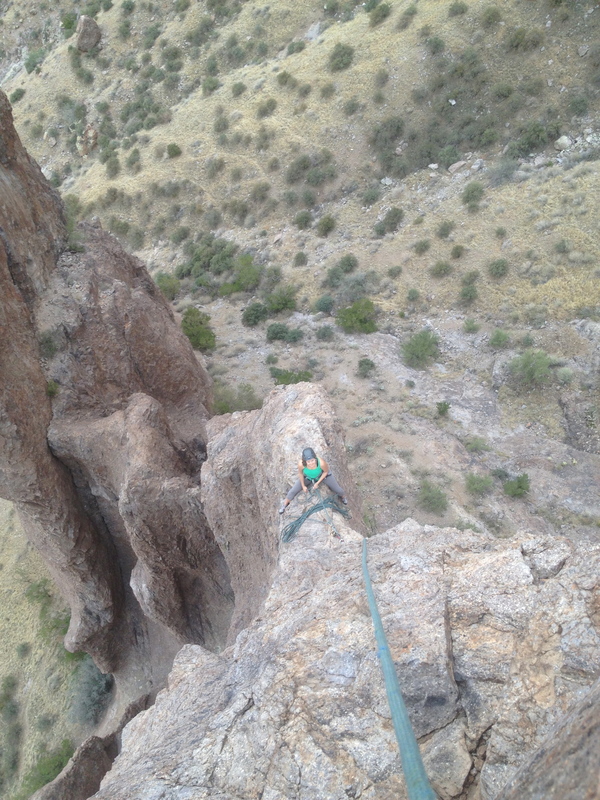 One double rope rappel took us back to our packs at the base and a sigh of relief. What a climb! I had the chance to guide the remote and classic Southwest Buttress of Dorado Needle a couple weeks ago during the AMGA Alpine Guides Exam. I’ll do a full blog post about the exam soon, but here’s a shot of Über-examiner Marc Chauvin cruising up the lower portion of the route!